It's a sad day for Filipinos. Today, Filipinos all over the world mourns the death of their beloved former President Corazon C. Aquino. She's been ill since last year but early this month, she was reported to be in a very serious condition and was confined to Makati Medical Center. She was diagnosed having colon cancer and was initially informed by her doctors that she had only three months to live. She undergone chemotherapy and her body positively responded to the treatment buying her more time. While carrying the burden of her health condition, she actively participated in Philippines' political issues, to speak out for the nation, to oppose the amendment of the constitution which was drafted during her time of presidency. She was vocal against the current state of the nation and urged Filipinos to pray during these tying times. She will long be remembered for her contributions to the nation especially during the People Power revolt in 1986 liberating the Philippines from a dictatorial government. 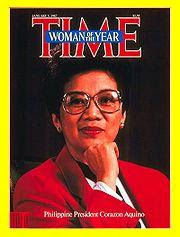 President Aquino was named by Time Magazine as the 1986 Woman of the Year. She was the first female president of the Philippines and Asia's first. She's one the icons of democracy in the world one of the world's influential leaders. We will surely miss your presence and inspiration Madame President and we're honored to have lived our life enjoying your most precious gift of hardwork, the reinstatement of our stolen democracy. Rest in heavenly peace, Madame President.